London Cleaner is a dynamic cleaning company established in 2001. If you’re living within Central and Greater London areas and looking for reliable domestic cleaning and commercial cleaning services, you’re at the right place. We work with full-time professional cleaners and hundreds of content regular customers. Our domestic and commercial cleaning staff have been thoroughly vetted, skilfully taught, and completely protected to clean your homes & offices. Another vital ingredient to our success is the way we treat our clients. We consider each of them as unique and therefore have specific requests and requirements. 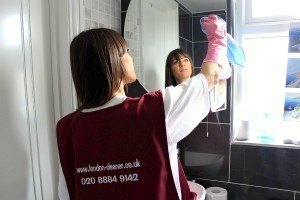 At London Cleaner we provide tailored plans to suit all budgets, requests and timetables and provide a free of charge estimate on all works. Phone or email us now if you have any questions about our cleaning services – click here to get in touch with us. Furthermore, our clients are consistently provided with a cleaning team whose only objective is to provide quality services to homes and offices in Greater and Central London. Our management has worked hard to identify and implement worker-centred plans to produce a sense of devotion and dedication to our London cleaning company. We are committed totally to exceeding our client’s essential and hopes and goal to develop and carry on being the cleaning provider of your choice. All potential staff is individually interviewed, assessed and trained. One of our strict requirements is to present proof of identification and address to verify the validity of who they are and their residential address. We obtain references to gain background information before we offer them work. Please contact us for more information and a free estimate on 020 8884 9142.